This is the official blog of Russian Artists Team on Etsy. We represent artists, designers and crafters from all over the world coming from Russian background and thus sharing the same language. The Russian nation has always been famous for its arts and crafts and we want to spread this word all over the world. The members of our team specialize in felting, knitting, jewelry making, photography, visual arts and natural cosmetics. New members are always welcome. We hope you enjoy your visit and come again, as the blog is updated with useful and interesting information on regular basis. Aren't these poppy flower earrings gorgeous? This poppy will enhance your natural beauty and will bloom forever! 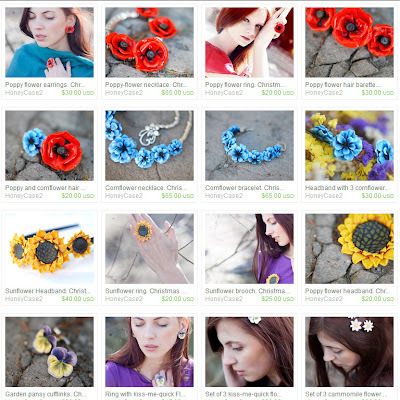 The poppy is a favorite flower of Olena Mysnyk, a jewelry designer from Ukraine and she is also the owner of HoneyCase2 on Etsy. This giveaway is from her! She believes that the bright red poppy is a very passionate flower and will suite a self confident artistic person perfectly. 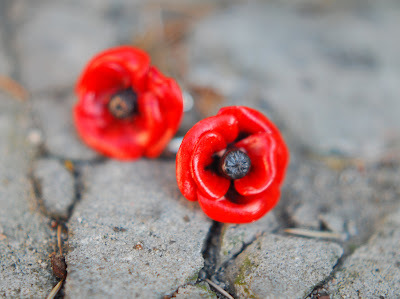 If you would like to receive these poppy flower earrings that will never wilt for free, join our giveaway! These earrings will make you a center of anyone's of attention! Please leave a separate comment on each entry and don't forget to leave us your email address so that we could contact you! This giveaway will run July 19 through 29th and the lucky winner will be announced on July 30th! My favorite item in your shop is white hazel tree berries earrings. Her jewellery is so realistic and lovely. My favourite would have to be the Poppy-flower necklace. I grow these poppies in my garden and love them. Close second would be he sunflowers- stunning. I have added the etsy shop to my favourites. I am your new fan on FB! I love everything in her shop! If pushed I'd say the leaf brooch. Maybe because it was the first item of hers that caught my attention. I've already hearted her shop! I LOVE all of Olena's jewelry!!! It's amazingly bright and beautiful! But I'm really in love with the Cornflower Bracelet! I have hearted her shop! Hello! Thanks for this opportunity. Why, the poppy earrings are my very favorite! ..and followed Honey Case blog. The cornflower necklace and bracelet are gorgeous. Most of all I like poppy and blue flowers! Oh, and new bookmarks with legs! I hearted HoneyCase2 shop on Etsy, I am Tirabaralla on Etsy. I am a follower of your blog via GFC as Tirabaralla. I am now following Olena's Twitter, I am @Tirabaralla on Twitter. I liked Olena's page on Facebook, I am Giovanna V. on FB. I am now following Olena's blog via GFC as Tirabaralla. LOVE Sunflower hair barrette from HoneyCase2 shop!!! I like the Cornflower necklace. Her shop is So creative! I like the Earrings with 3 leaves (Pastel green colour) and natural pearls. I just discovered her shop a few days ago, and was astonished at the gorgeous detail. My favorite design of hers is the cornflower collection. your things are SO beautiful, Olena! I love the poppy bobby pins and the wood cuff links the best...so so gorgeous. love love the poppy bobby pins and the forest cuff links, too! such lovely work! I followed Olena at facebook! I followed her at twitter! Her jewellery is so different and so versatile, ranging from the sophisticated and elegant but subdued look to the bright, cheerful in your face look. ALL HER THINGS ARE AMAZING!! Wonderful flowers... The Poppy-flower necklace, the Necklace with leaves and natural corals and the Earrings with white hazel tree berries are to die for! !